As companies are migrating to the Cloud, application performance needs to be seamlessly maintained. At Microsoft Ignite this week, the Azure Networking team has done a great job walking attendees through all the new cloud features released this week; the power of these enhancements; the breadth of solutions within Azure, ExpressRoute, as well as advanced connectivity with a deep focus on the needs of enterprise customers. As part of their sessions, they have consistently been highlighting the key ecosystem components – ADCs, WAN optimization, and Security Appliances. 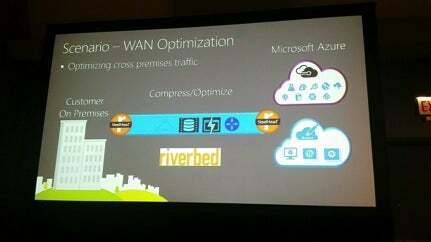 Riverbed is proud to be the featured WAN optimization partner.